Swagged versus Hard Cast Lead Bullets - Opinions? Re: Swagged versus Hard Cast Lead Bullets - Opinions? Unless you are wealthy, my advice would be to order the most reasonably priced bullets. If they are closely priced, I'd go with the swaged. The swaged usually have more uniform bases and weight. Leading is related to a relationship between hardness of the projectile vs. how hard/fast you push the projectile. When you are pushing the bullet nice and slow like we do, you want a soft projectile--so swaged lead is good for our application. For some action pistol shooters who need to push fast velocities, they are looking for cast lead that is harder cast--like 24 Brinnell. The softer lead will foul the barrel at high velocity but the hard bullets are fine. If you push the 24 Brinnell bullets at our slow speeds, they leave sort of a chalky fouling in the barrel--like rubbing a rock on concrete. Most mail order cast lead is 16-18 brinnell and can be used for most applications without leading. I know several high master shooters that shoot cast lead. Fancy bullets only show their advantages at the long line. It's my opinion that I need to be cleaning my short line more often before I start worrying about fancier bullets. Having used both, the swaged are more accurate as they contain no hidden air bubbles/flaws. Flyers dont seem to happen with swaged using light 3.8 gr of bullseye. I noticed that Magnus and Roze also has hollow point LSWC bullets. Never saw those before, only the jacket type. What advantage do they have in BE if any? Rob Kovach wrote: Leading is related to a relationship between hardness of the projectile vs. how hard/fast you push the projectile. When you are pushing the bullet nice and slow like we do, you want a soft projectile--so swaged lead is good for our application. Yes, swaged bullets are very good for our application. However, ONE of the most important factors is the fit between the bullet and the bore. The bullet should be .001-.002 larger than the bore diameter. Bullet hardness comes a distant second. Remember when Elmer Keith was developing the 44 mag, he was using hard bullets (at the time a BNH of 11-12 was considered hard) and didn't have issues because he was aware of the importance of fit. Hard is ok...as long as the bullets are larger than the grooves by 1-2 thousandths. Don't try them if they're undersized, you'll be mining lead. http://www.rozedist.com/ is another source for good swaged bullets. I've been doing some Ransom testing with both the 185 SHP and 200 SWC in several of my wad guns. Both show promise. They shoot as well as my best hand cast H&G 68bb. Fancy bullets only show their advantages at the long line. This! Along with the best of your cast bullets, properly fit to the bore and having perfect bases. As I've never seen your seating die, I can only tell you my experience. There was no deformation of the nose. Neither the 185 hollow point or the 200 SWC, but my bullet seater seats on the shoulder. I've used those bullets with my Dillon dies, and they never showed any deformation. are you using the swc side of the seating die insert? it can be flipped from swc to round nose. as for cheaper swagged 185s like zero sells try delta precision. DavidR wrote: are you using the swc side of the seating die insert? it can be flipped from swc to round nose. as for cheaper swagged 185s like zero sells try delta precision. Precision delta's 185 swchp seemed to lead more in my gun than the Zero ones. The Zero's have a sticky type lube and the Precisions a dry powder, that may be the difference. I'm using the Zero brand 185 SWC HP .45 ACP. They have a sticky lube in two shallow grooves. I tumble lube them with Lee Liquid Alox prior to loading. Have no leading issues with those. I believe the combination of conventional wax lube groove and the LLA is the best method. Just a small amount to give a light coating. Allow them to dry on an old cookie sheet for a couple days prior to loading. Started doing this for all my lead projectiles and very happy with results from .32 wadcutter to .44 mag. 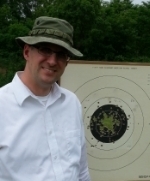 Before I purchased Magnus bullets,,,, I used the 200swc at 50yd and our old 185 button nose at 25yd. Loaded on rcbs green machine . 2658 my high ,, many high master scores for over a decade. Mixed brass mostly. Ransomed the guns and ammo every few months to insure accuracy. Long before swaged became popular. Won several regional and state matches, on ultra dot team and Springfield teams. Hard cast will do the job, spend time on training, shoot matches, all matches you can, bullseye is mostly a head game. Get a load the gun likes, and you trust. Then shoot. We give discount to shooters. Magnusbullets wrote: Before I purchased Magnus bullets,,,, I used the 200swc at 50yd and our old 185 button nose at 25yd. exactly, we all tend to get lost in details that really just show that there are many good paths to a high score and none are really the holy grail better than others. Every good made bullet, with a good powder, loaded correctly out of a accurate gun will shoot a X at 50 yards, the point here is, its everything else that will determine your success in this game. Dan may feel the need to re-lube his bullets but I and many of my friends have bought and shot many thousands of these bought from magnus and zero with no leading issue, leading is sometimes the barrels fault not the bullet. 44.41/500 45-185-swchp swaged lead, plus flat rate shipping, any quantity, 3,000 in stock, more next week. ship cost depends on dollar value in the box at post office, about 13.00-16.00 per 2000 in US mail flat rate box.